If you look at some of the healthiest diet plans, such as the Mediterranean Diet or the DASH diet, you will notice that they recommend you make seeds a regular part of your eating plan. Seeds are nutrient-dense foods high in protein, fiber, healthy fats, vitamins and minerals. Different seeds, such as the flaxseed and pumpkin seed, offer different health benefits. Comparing the two will show the benefits of including both in your diet. There is a slight calorie difference between flaxseeds and pumpkin seeds with the flaxseeds containing more calories per serving than the pumpkin seeds. A 1/4-cup serving of whole flax seeds contains 224 calories, while the same size serving of dried pumpkin seed kernels contains 180 calories. The U.S. Department of Agriculture recommends you vary your intake of protein-rich foods by including more foods like flaxseeds and pumpkin seeds in place of red meat and chicken. A 1/4-cup serving of flaxseeds and pumpkin seeds respectively contain 8g and 10g of protein. Most of the calories in both the flaxseed and pumpkin seed come from its fat content. However, both are high in the heart-healthy monounsaturated and polyunsaturated fats. A 1/4-cup serving of flaxseed contains 18g of total fat, 1.5g of saturated fat, 3.2g of monounsaturated fat, and 12g of polyunsaturated fat, and the same serving of pumpkin seeds contains 16g of total fat, 2.8g of saturated fat, 5.2g of monounsaturated fat, and 6.8g of polyunsaturated fat. The one significant nutritional difference between the two seeds is the omega-3 content in flaxseeds. A 1 tbsp. 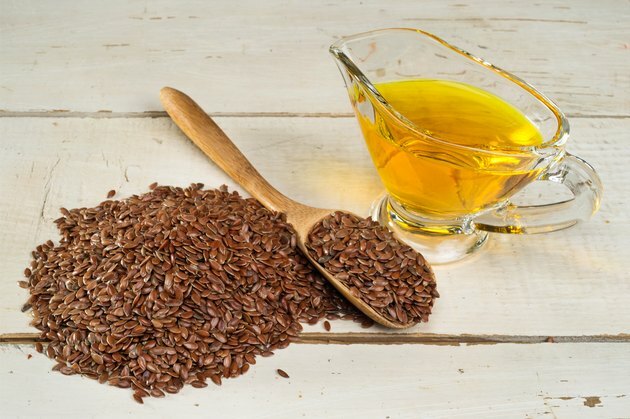 serving of ground flaxseed provides 1.6g of omega-3 fatty acids, which meets the Institute of Medicines recommended daily intake of 1.1 to 1.6g of omega-3 fatty acids per day. Including more omega-3 fatty acids in your diet can help improve blood pressure, blood cholesterol levels, and heart health. Pumpkin seeds are not a significant source of omega-3 fatty acids. Flaxseeds are also significantly higher in fiber than pumpkin seeds. In fact, whole flaxseeds are used as a laxative to help improve bowel movements. A 1/4-cup serving of whole flaxseeds contains 12g of carbohydrates and 11.5g of fiber, while the pumpkin seeds contain 3g of carbohydrates and 2g of fiber. Women need 21 to 25g of fiber a day, and men need 30 to 38g of fiber a day. As a nutrient-dense food, seeds contain high amounts of essential vitamins and minerals in a small serving. A 1/4 cup of whole flaxseeds contains 107mg of calcium, 1.8mg of zinc, 2.4mg of iron, 341mg of potassium, 165mg of magnesium and 37mcg of folate. A 1/4-cup serving of pumpkin seed kernels contains 15mg of calcium, 2.5mg of zinc, 2.8mg of iron, 261mg of potassium, 191mg of magnesium and 19mcg of folate.